Plant out annual summer bedding plants now the risk of frost has passed. 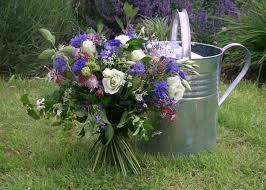 Gather your containers, hanging baskets and planters and plant up now that the risk of frost has passed. If they have been in your greenhouse until now, move them to their final position. Lift and divide overcrowded clumps of bulbs such as Snowdrops and Bluebells when their leaves have started to turn yellow. Ensure you water newly planted trees and shrubs well, until they are established. There’s still time to sow annual plant seeds. Fuchsias – pinch out the tips to encourage bushy growth and more flowers. Keep hanging baskets looking good and encourage bushy growth by trimming off leggy or misshapen growth. As soon as your sweet peas start to flower, encourage them to flower more by regularly picking the flowers. Dead-head roses if they are repeat-flowering types. If they have seed heads leave them on. Cut back Oriental Poppies close to the ground after flowering – this will stimulate new growth. If you have hardy Geraniums, cut them back towards the end of June, when they’ve finished flowering, to encourage new growth and flowers. Stake tall perennial plants to prevent wind damage. Climbers such as honeysuckle and clematis – watch for new growth and tie in.